A Parent Council is the group of parents in school representing parent views. They work in partnership with pupils, the head teacher and the local authority to achieve the best for their school. When your child starts school, you automatically become a member of the parent forum and you can stand for election to the Parent Council. At The Royal High Primary, all parents, as members of the forum, are welcome at all meetings, whether they are elected to the Parent Council or not. New faces are always welcome, and new ideas, skills, and offers of help even more so! For those of you who couldn’t make it to the PC fundraising event Band & a Buttie on Friday night, here’s what you missed! Firstly, a huge thank you to Kathryn who organised the event and instigated this little dance troupe. So much work and time has gone on behind the scenes to make this event such a fun and monumental success – watch out for grand total ££s raised soon. Big thank you to Duddingston Golf Club for giving us the venue and the delicious food, we could not do this without their generous help. Also thanks to Jez Curnow of Timebase TV for filming and editing us to look so good so we can share with you the spectacle that is The RHP School Belles! Hope you can join us next year for more FUN-draising hilarity. Feelng proud — with Timebase.TV at Duddingston Golf Club. The Scottie – meal for two. P3 explaining why the whole school needs sun blinds. Parent Council meeting is on Weds 24th April at 7:30pm in the staff room. Spring Disco – May (dates tbc) check out Facebook for event details. AGM & PC meeting will be held on Weds 12th June 2019 in the staffroom or Quad if the weather permits. View the Parent Council Facebook Page – this is a public page where you can find out information about events and developments at the school. 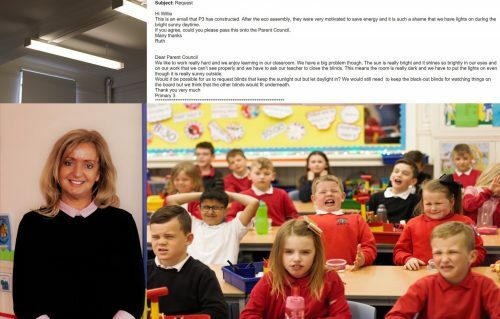 Join the Parent Council Facebook Closed Group – this is a closed group for members to share photos and news about the pupils, staff and PC achievements. encourage links between the school, parents, pupils, pre-school groups and the wider community. For example, The RHPS After-school Club works with Parent Council to report back to all the parents in the school (Parent Forum). At Royal High Primary, most parents on the Council, and who attend meetings, simply want to help the school and improve things in any way they can for their children. Every year, the parent forum elects a Parent Council, at an AGM which is announced in the school newsletter. After this meeting, which any parent/carer can attend, there are several meetings a year, usually on Tuesday evenings at 7.30pm in the school. New blood, fresh faces and ideas are always very welcome. If attending meetings is difficult, you can become involved by helping at events; man a stall, send in home baking, help publicise events, there is no shortage of tasks! Lots of parents also bring their children to events to help too, and pupils seem to enjoy the responsibility and getting to see behind the scenes!